information session sponsored by the Career and Advising Center. Call, (253) 833-9111, ext. 2641 for dates, times, and locations. 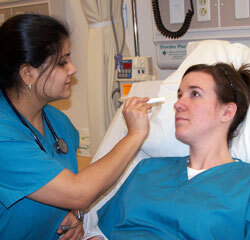 Students working toward applying in the Practical Nursing program should meet with the PN adviser by calling ext. 2641 for an appointment. A Practical Nursing certificate signifies that the holder of the certificate has been educated to competently practice basic safe nursing care in a variety of settings. Students should have the following skills so that they can provide care and treatment for their patients and clients. Standing and walking is required for 8-40 hours per week. The student may be required to sit to receive or to give oral reports, breaks, conferences and classes. The student is required to lift medical supplies, equipment, and other treatment items up to ten pounds. The student may need to lift CPR equipment that weighs up to forty pounds. The student must have, within reasonable limits, the ability to lift patients, transfer patients in and out of bed and on and off a commode, and to assist others with patient lifts and transfers. Patients may have various weights and the student must have the ability to assist in their transfers and lifts. Skilled nursing care requires touching the patient/client and having them touch your upper body when assisting them up, out, and back into bed. The student may be expected to push and pull equipment that includes monitors, wheelchairs, gurneys, patient room furniture. The student may be expected to pull the patient up in bed. The student may be required to climb a footstool, as well as climb stairs. The student may be required to reach above his/her head, i.e., to add irrigation solution or to add an additional IV solution. The student may be required to squat or kneel, i.e., to do foot assessment/care for the patient. The students may be required to use foot controls on beds, gurneys, and other special equipment. The student is responsible for their own transportation. Some of our community/clinical lab sites may not be within a convenient bus route. Nursing students must have the means and ability to travel a distance of up to 60 miles one way to a community lab site. Students must have fine motor skills for tasks such as administering injections, sterile insertion of catheters, needles and eye drops and wound irrigations. The student must be able to assess the patient through palpation with fingers and hand. The student must be able to distinguish between hot and cold and able to feel vibrations. The repetitive motion of hands and fingers is required for typing and writing related to chart entry/documentation. Sound - The student must have hearing/hearing aid accommodation in order to perform physical assessment with a stethoscope for bowel tones, heart and lungs sounds. The student must be able to hear a frail, weak voice of an elderly person call out for help. The student must be able to communicate over the intercom and phone. Sight - The student must have visual acuity within normal accommodated limits for monitoring equipment, reading computer charts, preparing medications for injections, and detecting changes in the color of lips, and nail bed coloring. Depth Perception - The student is required to have depth perception for administering injections, sterile insertion of needles, catheters. Smell - The student must have a normal sense of smell to detect odors indicating unsafe conditions or changing patient status. The students must be able to effectively communicate in English (oral and written) forms. The student must be able to process patient information and communicate it effectively to other members of the healthcare team. The student must be able to communicate effectively in oral and written form with the patient and their friends and families. The student’s ability to communicate also includes the ability to recognize when to consult with their faculty member in a timely manner as it relates to the patient safety and welfare. A student must be able to measure, calculate, reason, analyze, integrate, and synthesize in the context of college-level nursing. The student must be able to read quickly and to comprehend directions as they analyze, evaluate, and to apply information and to engage in critical thinking in the class room and in the community lab setting. The student must have the emotional health required for the full utilization of his/her intellectual abilities, to exercise good judgment, and to promptly complete all responsibilities that accompany safe patient care. The student must be able to work with all disciplines on the care team. The student must abide by the professional standards as identified by the curriculum concept threads identified in the Nursing Student Handbook. A student must not pose harm to the patients or other healthcare team members. The student must abide by the standards of the program of practical nursing and the uniform disciplinary act that include but not limited to, ethical and moral behavior.